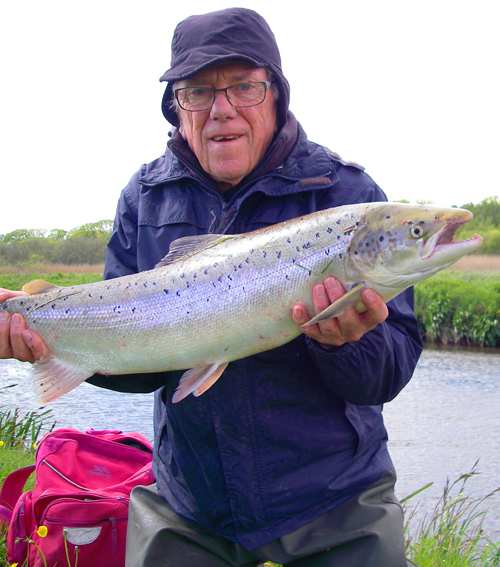 I do enjoy a spot of seatrout fishing but I never like to spin for them before the 16th of May when it becomes legal to use spinning gear for salmon in Dorset rivers. Anyway, this afternoon the rain stopped, the sun came out and my wife was away digging up Roman remains so I decided to have my first attempt,this year,to catch a seatrout. I was using my little Teklon rod and Mitchell Mag Pro reel loaded with 20lb BS Nanofil braid. On the end was a metre or so of 15lb clear Amnesia, a pike-proof American Fishing wire trace and a black and silver J9 floating Rapala. I started off by wandering downstream and casting down and across into all the fishy looking spots and retrieving slowly against the flow. After I'd covered about a mile of water I'd only had one tug, probably from a small trout. I considered changing lures to work my way back up but I rarely change just for the sake of it and I told myself that the Rapala was probably as good as anything in the clear water. It was extremely windy and on two or three occasions I was grateful for the braid which allowed me to jerk the lure free of vegetation on the far bank. I made my way back up to where I'd started, this time casting up and across into likely places and winding fast enough to make the lure work with the flow. I continued on upstream with no result until I came to a relatively deep , slow glide where I sometimes fish for pike in the winter. I flicked the lure up to the far bank and began to wind. About half way across the plug was taken by a heavy fish and I immediately thought "pike!". I soon changed my mind when the fish began to shake its head and twist to show a deep, silver flank. I was clearly into a good salmon. At first my fish didn't do much apart from swimming round in mid-river with periodic bouts of head shaking. After a couple of minutes the salmon stopped its messing about and set off upstream, dragging line off against the clutch at a fair rate. After it had gone perhaps thirty metres I was beginning to think it was a good job I'd changed the trebles for 3x versions (this was a result of losing a very big salmon a year or two back). It continued the upstream progress with me following behind until we began to approach a big, impassable hawthorn bush on my bank. Now I stopped and palmed the spool to add a bit more pressure in the hope of turning the fish. It worked and now I felt as though I was in control. I walked the fish back down until we reached a relatively shallow spot. 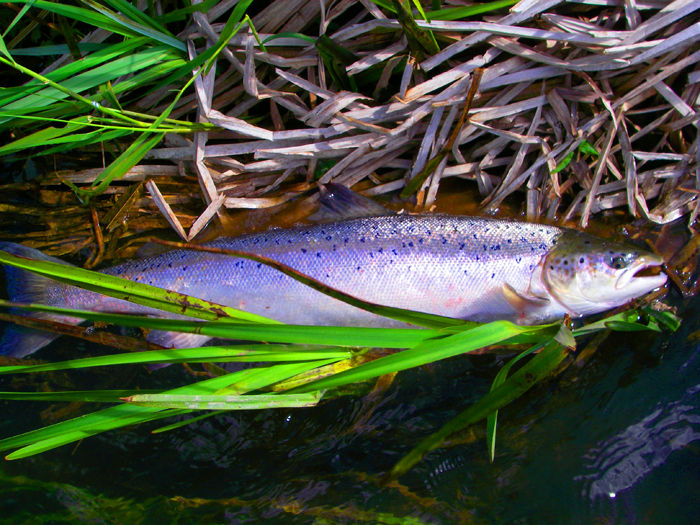 I slid down the grassy bank, grabbed the salmon by the wrist of the tail and with my other hand under its belly lifted it onto the bank. A couple of quick pictures and then I removed the hooks with my pliers before we (the fish and I) slid back down into the water. It was probably ten minutes (and a very wet sleeve) before I felt that it had fully recovered and was able to let it go but I managed one more picture as it lay in the edge before swimming away. Eighteen pounds and pretty fresh. 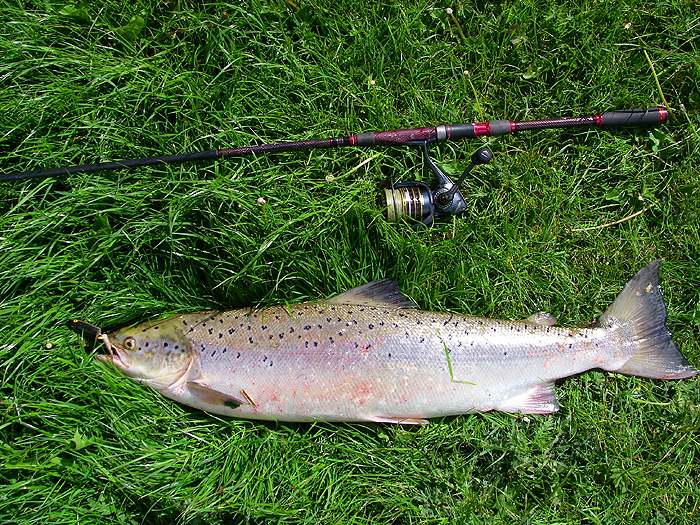 Not the desired seatrout but all in all a good first session and a pleasant change from my recent blanks at the coast.